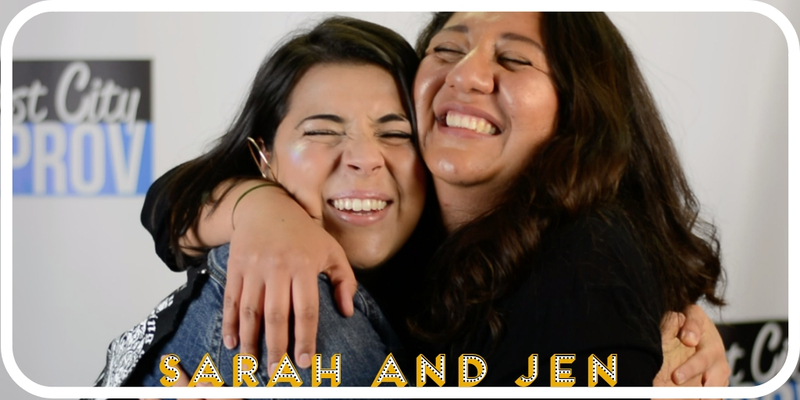 Inspired: An Improv Blog Laugh with #BestImprovFriends Sarah and Jen! For our very first double community spotlight, we had to sit down and chat with two ladies who met in level 1 improv and now are inseparable parts of each other’s lives. Both of them joined improv to spark joy in their lives– Sarah’s husband was deployed, and Jen was facing life choices and a need for change. Through improv they not only found each other, but also a new found confidence and joy. “Improv has grown to be a major part of my life in a very short period of time. I started taking classes at FCI after spending some time trying standup comedy. Comedy has always been a part of who I am and women in comedy like Amy Poehler, Maya Rudolph, and Tina Fey are my inspiration. I have always wanted to provide an opportunity for people of color to be able to laugh and see someone who looks like them on a stage. I learned much from my time doing standup, but I never felt quite at home. The laughter was there, but I still needed something a little different. I found what I was looking at Finest City Improv. Improv has been a tremendous outlet for me and allows me to be completely myself. My spouse recently deployed for nine months, and improv truly helped me get through that difficult time. I feel at home on an improv stage and genuinely enjoy every opportunity I get to perform. and Jen shares more of hers: “My first experience with improv occured back in middle school drama class. After one improv focused class, 12 year old me quickly came to the rash decision that I would never try improv again. Throughout my time in middle school and high school theatre, I avoided improv like the plague. Much to my surprise, this art form provided the comfort and confidence that learning-how-to-adult me needed. Prior to joining FCI I was experiencing an emotionally difficult period in my life. Through teaching myself how to play the ukulele, I discovered that the arts brought me great comfort during these turbulent moments. With the desire to reconnect with my past theatre self, I stumbled upon FCI’s free improv class in a night of a google frenzy. That free class was the first time my troubled thoughts dissipated and instead I was enveloped in happiness and laughter. After that first class I knew I was hooked. I was immediately welcomed and accepted by my classmates and the FCI community as a whole. I was enraptured by the philosophy that everyone’s experiences and backgrounds are valid and worthy to be shared on and off stage. It has allowed me to connect deeply with my peers and instructors resulting in friendships I would have never imagined. I think the most unexpected outcome from this experience is the drastic increase in my own confidence. It is such an empowering feeling that has transcended into the many facets of my life. Meet them in the video below!